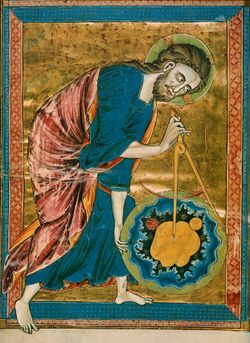 Christ depicted as architect of the earth and Creation. The term creation signifies both an act and the result of an action in which an agent (the creator) brings about the origin of an entity. In particular, creation refers to the act whereby an agent, notably God, brought the cosmos into existence from a state of non-existence. Creation in this sense is distinguished from mere change or transformation of something pre-existent. Universal creation or cosmogony is any doctrine or theory concerning the coming into existence or origin of the universe or cosmos. Biological creation is any doctrine or theory concerning the coming into existence of life from already created life through different kinds of organisms. Human creation is any doctrine or theory concerning the coming into existence of human beings or human souls. Creation entails a creating agent or creator and a creative purpose, a teleology, that may be evidenced by design. However, in some theories, such as Intelligent Design, creation is implied whereas the creator and purpose are not specified. The major monotheistic religions are agreed on several points about universal creation: the agent is God who alone and free from exterior compulsion and inner necessity, created a good creation and maintains all created entities in existence. However, the extent to which God acts directly or indirectly in biological creation and human creation is not an area of common agreement. Universal creation is described by cultures all over the world and one central theme is found to emerge — order from chaos. The cosmos is singularly defined by scientists as possessing order. In fact, it is this apparent order that inspired early scientists to study astronomy and physics and describe related phenomena in mathematical terms. Human creation is any doctrine or theory concerning the coming into existence of human beings or human souls. Biblical human creationism is based on the Bible, which states that human beings were created on the 6th day of creation following land animals approximately 6000 years ago. The book of Genesis states that man is distinct from the animals, and was created in the image of God. The creation is described by cultures all over the world. The most famous of which can be found in the first chapter of the book of Genesis in the Bible. Creation Ministries International points out that Indian creation myths have remarkable similarity to the account in the book of Genesis. The opening chapter of the Bible (the Book of Genesis) provides an account of the creation of the cosmos and the Earth with all its inhabitants. The creation is described as occurring through a specific sequence of events over the course of 6 days. Day 1 — God created Earth, space, and light. Day 2 — God created the atmosphere. Day 3 — God created dry land and plants. Day 4 — God created the sun, moon, and stars. Day 5 — God created the sea creatures and birds. Day 6 — God created the land animals and man. Many people argue that the "days" in the creation account should not be taken literally as a definition of time. Others hold that it is reasonable to assume that the most straightforward reading of these passages should take place. Furthermore since God created time and language, and described the events in terms that clearly correlate with the length of a solar day, any other definition confuses the author's intent. People who hold to the literal view of the creation days are known as young-earth creationists. By contrast, old-earth creationists argue for nonliteral interpretations of the word "day" in Genesis 1, and instead hold that the creation occurred over vast periods of time. It should, however, be noted that the sequence of events in the Biblical creation account cannot be correlated with the developments proposed by either big bang cosmology or the theory of evolution. If accurate, the Biblical creation conflicts with both of these secular explanations for the origin of the cosmos. 1. The contrast between the biblical creation account and other ancient Near Eastern epics. 2. The various literary/contextual reasons to take Genesis 1:1 as an absolute sentence ("In the beginning God created . . .") rather than as a construct ("When God created . . ."). a. God is always the subject of the verb bārā' (the relevant uses are in the Qal and Niphal stems). b. No material is mentioned in connection with God's creative action. c. God's creating by his 'word' reflects an effortlessness and freedom not communicated by a doctrine of creation out of eternally preexistent matter. d. Bārā' captures the breadth of God's creation from start to finish--unlike words such as 'make' or 'form'. 4. The 'totalism' of the OT creation passages (e.g., "the heavens and the earth," representing the 'totality' of creation) strongly implies that nothing is left out of this comprehensive description; God and his creation constitute the sum total of reality. 5. The Creator-creature contrast in the OT and carried over into the NT) takes for granted God's intrinsically enduring nature as opposed to creation's inherent finitude and transitoriness. The Roman poet Ovid (43 B.C.-17 A.D.), in his Metamorphoses, elaborated an account of cosmic beginnings--the creation of the world out of chaos--that had obvious affinities with both Hebrew and Greek explanatory traditions. Questions of origins were especially topical during Ovid's time when Rome was transforming itself from a republic into an empire. The Santals are a numerous tribal people living in several states in eastern India. Among them live itinerant Hindu professional storytellers and painters (jadupatuas), who recount Santal stories, and religious beliefs. The Santal creation story includes three principal Santal deities, Maran Buru, Jaher Era, and Sin Cando. Water and water creatures made first by the creator, Thakur ("the Lord"). From the mating of two geese come the first human couple and from them their seven sons and daughters, who marry each other and then divide into clans so that siblings may no longer marry each other. Professional storytellers in Africa collected and told the stories of the past, including the story of the Yoruba people of West Africa. The Yoruba regard the city of Ife as their place of origin and the site of earth's creation. Ancient stories retell the creation of Yoruba and features Olodumare, the Lord of Heaven and the Creator, and Orisanla, deities in the Yoruba pantheon of gods. Craig, William Lane and Paul Copan (2004). Creation out of Nothing: A Biblical, Philosophical, and Scientific Exploration. P.O. Box 6287, Grand Rapids, MI 49516-6287: Baker Academic a division of Baker Publishing Group. ISBN 0801027330. http://books.google.com/books?id=LxFQA_Rn7X8C&printsec=frontcover&dq=Creation+out+of+Nothing:+A+Biblical,+Philosophical,+and+Scientific+Exploration&hl=en&sa=X&ei=XD0IUtnBIKrIigLDzIGQDw&ved=0CC8Q6AEwAA#v=onepage&q=Creation%20out%20of%20Nothing%3A%20A%20Biblical%2C%20Philosophical%2C%20and%20Scientific%20Exploration&f=false. This page was last modified on 4 August 2015, at 08:30.